With endless options to customise your ID, membership, bank, customer loyalty and access cards, eMedia CS2 is the ultimate tool for plastic card design, compatible with all printer models. This version has faster and improved navigation and can be moved between PCs an infinite amount of times. Whilst it is single user software, it can simply be deactivated on one PC before being transferred and reactivated on another. Please note that eMedia CS2 will read existing eMedia Card Designer and eMedia CS templates. Dual mode operations for design and printing. Design mode can be password protected to prevent the design being altered. eMedia CS2 is the ultimate tool for plastic cards design. The software enables the design of ID badges, security and access control badges, transit passes, membership cards, customer loyalty cards, bank and payment cards and all types of official documents. Available in Standard and Professional editions, the user-friendly design features of eMedia CS2 have been developed and refined over many years to work with eMedia Card Designer templates and to be compatible with all plastic card printers, laser and inkjet printers, ultra portable printers and Adobe PDF. The flexible functionality allows you to customise both sides of your card with text, images, barcodes, QR-Codes and different shapes. Import photos from your digital camera, webcam or smartphone directly and then easily resize, crop, rotate and zoom your pictures. eMedia CS2 can also read and modify data in your database, encode magnetic strips and write the smart chip in a single operation. For the more advanced card design, eMedia CS2 has powerful development tools including the capacity for formulas, scripting, plug-ins, COM server and Wifimage+ so there is really nothing that this software can’t produce. 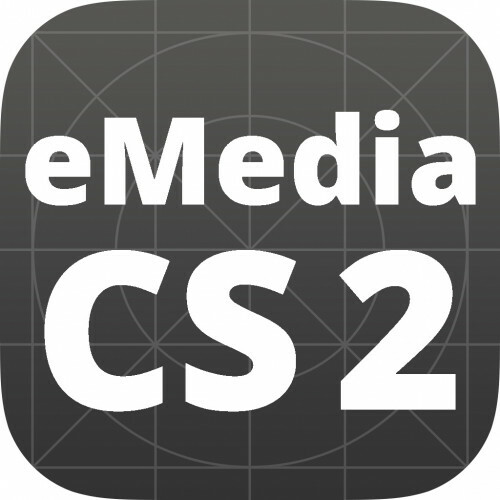 e-Media CS2 has a design mode and operating mode to allow multiple users to work on data, design and editing at the same time. The system is password protected to prevent users from modifying or copying card designs and is also available in English, French, German, Italian, Spanish, Dutch, Russian and Simplified Chinese. Multilingual - English, French, Italian, German, Dutch, Russian and Simplified Chinese.